Cyclones are commonly used in naphtha-based Froth Treatment facilities to remove fine solids and water from bitumen emulsions. Cyclone design and operation is very similar to the traditional hydrocyclones used to separate minerals in the mining industry. When naphtha is added to bitumen froth during Naphthenic Froth Treatment (NFT), emulsions of bitumen, water and fine solids tend to form within the inclined plate separators (IPS) which can be very difficult to break up using only gravity separation. Cyclones can be used to impart a higher g-force and break up these emulsions. 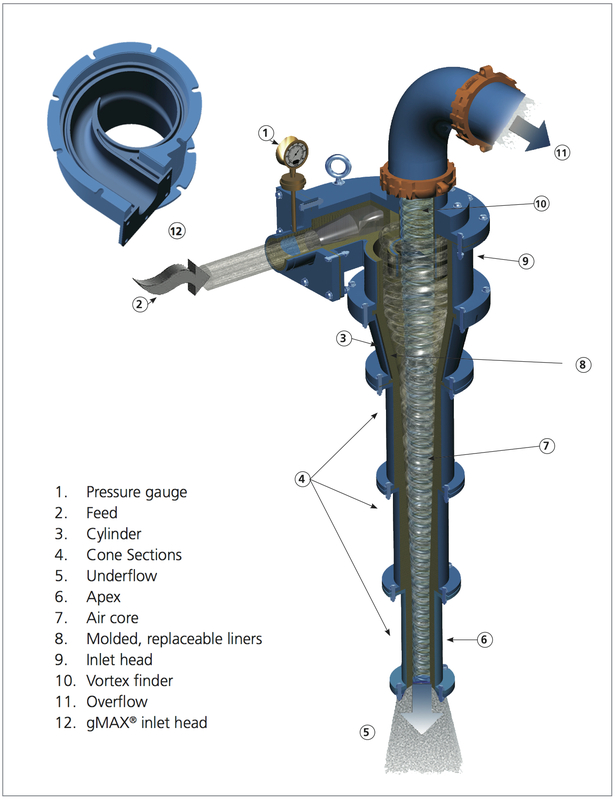 This facilitates the liberation of diluted bitumen, allowing for solids and water to be rejected to the underflow. Although the g-forces imparted by the cyclones are not nearly as large as the forces generated by centrifuges, cyclones have no moving parts and are far less expensive to operate. Flow to the cyclone is fed under pressure, causing the mixture to rotate around the perimeter of the cyclone. 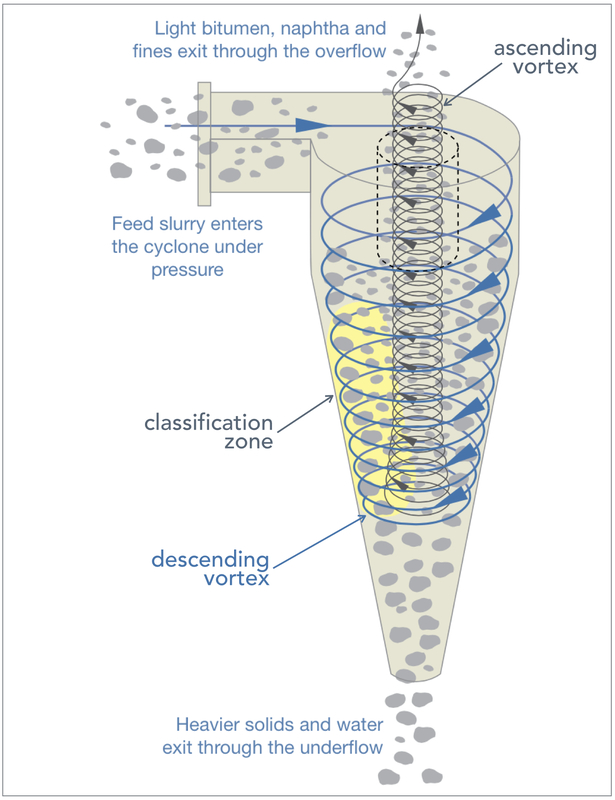 The swirling action generates a zone of low pressure (or a vortex) along the centre axis of the cyclone, causing the lighter material (bitumen/naphtha) to flow upwards and be recovered to the overflow stream. Heavier particles (water and solids), move towards the outer wall of the cyclone, and get pulled down through the apex, into the underflow. The size of the apex is a critical process variable. An apex that is too large will result in poor separation. A smaller apex will provide better separation efficiencies but is more susceptible to plugging. A good rule of thumb for cyclones is that the apex should be at least 3 times larger than the largest sized particle in order to avoid plugging. However, this is not always practical. When 2 sets of cyclones are installed in series, the second stage cyclones are typically smaller in size, providing higher centrifugal forces. Higher forces provide better bitumen/naphtha recovery, sending less hydrocarbon to the underflow. cyclone geometry, particularly the diameter of the apex. Due to the very high swirling velocities of the slurry, the apex portion of the cyclone is subject to a high rate of wear and must be frequently inspected and periodically replaced. A narrower apex will obviously wear out faster than a larger apex. Cyclones used in the oil sands are very similar in design to those used in the conventional mining industry (sometimes referred to as hydrocyclones), which the exception of the different liners and wear materials used for internal components. Cyclones are arranged in radial clusters, known as cyclopacs, where each individual cyclone can be isolated for maintenance without taking the entire cyclopac out of service. The most common brand of cyclones found in the oil sands are the Krebs gMAX Cyclones, manufactured and distributed by FLSmidth. The use of cyclones to break up emulsions in a naphthenic Froth Treatment process was patented by Suncor in 2006 and first commercialized at the Millennium NFT facility. Cyclones are also used at Horizon. In both cases, the cyclones are used in conjunction with inclined plate separators.